Dr. Nackers practices Health Psychology at UW Health and specializes in helping people cope with chronic illness and adjustment issues, health behavior change, and treatment of patients with a variety of health problems including weight, diabetes, insomnia and pain. She provides both inpatient and outpatient psychological assessment and treatment to adult medical patients and their families. Dr. Nackers also specializes in wellness and prevention and is involved in developing and leading group-based healthy lifestyle programs. Dr. Nackers is listed in the National Register of Health Service Providers in Psychology and is a member of The Obesity Society, American Society for Metabolic and Bariatric Surgery, Society of Behavioral Medicine, American Public Health Association, and American Psychological Association Division 38: Health Psychology. She is licensed by the States of Wisconsin and Illinois. 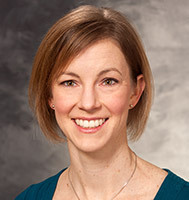 Dr. Nackers' research interests include factors associated with weight change and long-term weight maintenance, group dynamics in health behavior change and food insecurity.